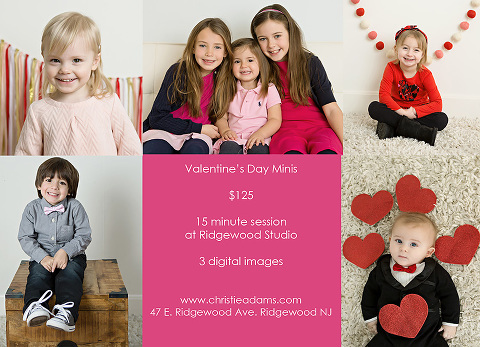 I’m excited to announce 5th Annual Valentine’s Day Mini Sessions at my Ridgewood studio in Bergen County! They will take place on this coming Monday (MLK Day) January 15th as well as January 22nd and 26th. The minis include 3 digital images for $125. After the session, there will be the option to add on additional digital images as well as prints, Valentine’s Day cards or bookmarks. It’s been a year (my three girls are at the top of your ad for Valentine’s mini sessions). Can you tell me what times you have available and if you have two back to back could I take those two and use the 30 minutes for my 3 kids, 6 images etc?